Alessandro International Striplac Peel Off Activator ensures the clean and effortless removal of the chosen Striplac nail lacquer. Allowing you to switch up your style as often as required, Striplac Peel Off Activator glides cleanly over the finished nail, adding hydration at a cellular level whilst lifting the colour painlessly and seamlessly, resulting in a film of polish that peels off smoothly without fuss. Say goodbye to the old you with the innovative Striplac Peel Off Activator. 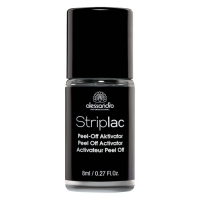 Tip: Always apply Striplac Peel Off Activator before removing your current Striplac nail lacquer.